The Sichuan earthquake has left 1.4 million farmers in about 4,000 remote villages in absolute poverty, an anti-poverty official said Monday. Xu Hui, department director of the State Council's Leading Group Office of Poverty-Alleviation and Development said a village needs an average investment of 3 million yuan ($438,000) to recover permanent shelter, infrastructure and basic services. That means the government should "pump in a minimum of 12 billion yuan" into the poor villages in the coming three years to ensure the villagers' basic necessities in Sichuan, Gansu and Shaanxi provinces, he said. Most of the villagers will not be relocated out of their own villages when deciding the locations of their new homes, he said. "They are encouraged to build their new houses within their villages but being geologically safe is a precondition," Xu told China Daily at Monday's international seminar on anti-poverty and quake recovery. The government will help roll out a recovery program for every poor village by the end of next month and local farmers, who earned the lion's share of their income by working as migrants, are encouraged to take part in the recovery efforts, he said. An official survey has found that nearly all of the migrants in Sichuan province, in which 35 counties have been severely damaged by the quake, have returned home after the quake, which killed at about 70,000 so far. And most of them have decided not to work as migrants until their own homes have been completed by their own hands. "We found only about 10 percent of farmers in the villages are now working near their home counties and they will return once the recovery programs start," Xu said. Fan Xiaojian, director of the State Council's leading group office of poverty-alleviation and development, said China has been tentatively listening to international experiences and lessons when designing recovery efforts of the quake, which have affected more than 47,000 villages in the three provinces. "The damage is so massive and many farmers have reversed into poverty again," Fan said. "In many counties, the hard-won anti-poverty achievements in previous two decades disappeared within seconds," he said. 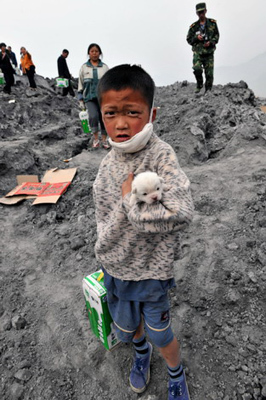 Before the quake, about 2.1 million people in Sichuan were living in poverty incomes, according to official figures.